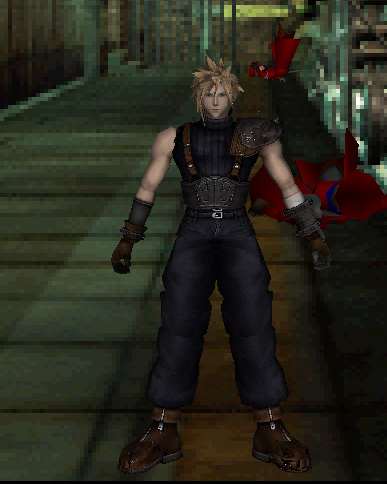 Hello guys, this is the first time I´m posting here, although I´ve been reading a lot of posts and learning stuff about how to modding FF7 in this forum for the last two weeks, so before asking for any help, I would like to express my grattidude for the nice forum and the very good tools that some people have released in the past through this forum to make the modding of FF7 possible for everyone. Thnx!! 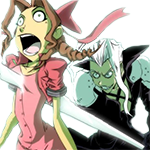 Edit: Also I´m using 8 bits and 256 colours BMP image files!! Sorry my english and thnx in advance! are you sure doing every thing right ? since your characters are black , i think you forgot applying the maps. Oh no I meant "blank" not black. But yea, since this is the first character I´m working on, I´m not sure if I´m missing some steps since the tutorials I have read are not "step by step" ones, so I´m a little bit confused about the exact procedure, but still it seems that I´m doing right, otherwise I think Kimera and biturn could not show the textures properly on this character. I´m working on a Cloud Field model, based on APZ´s one, but with a few of modifications, it has 2 different UVs which have been already assigned to every part of the model by editing the .RSD file. Here 2 pictures, I can´t understand what is the problem. It's been a while since I messed with any of that... just double check your hrc and rsd files. The newest Kimera is pretty hard to trick into working without it working in game. This is the file: "ejdf.rsd" from the Luis Avile´s custom Zack model. This file is referring to the chest of the model called "EJEA.p"
-Why is the same texture (ejfa) being assigned twice, to this chest? I thought you had to do that when you want to assign 2 different textures to the same object, but now I´m really confused, and this is only one of the many files I have seen with the same thing. -Also, do I need to put some special name to the texture files I´m using on my character, or any name is ok? You do only need 1 tex file assigned. All you have to do is open that p file in the p editor part of kimera and change the group properties so that the second part uses tex0 as well. 2 of the same texture being assigned to the same piece happens when a model is created wrongly and/or Kimera isn't double checked behind once completed. So there is no reason why except that Kimera isn't perfect. Thnx for ur answer obesebear, so it seems like I´m doing well with rsd files. But after several attempts to fix my problem with textures, still nothing, this is so sad I re-converted the textures (8bits bmp) with image2tex and still it won´t work in game. I´ve tried everything with no success, I'd be glad if someone could check this character and tell me what I'm doing wrong, pls let me know if I can share the download link in this thread or maybe I can send it to someone by pm?. Thnx!! Send it to me an I'll have a look. I'm pretty curious what the problem is. Done!! I sent it to you. 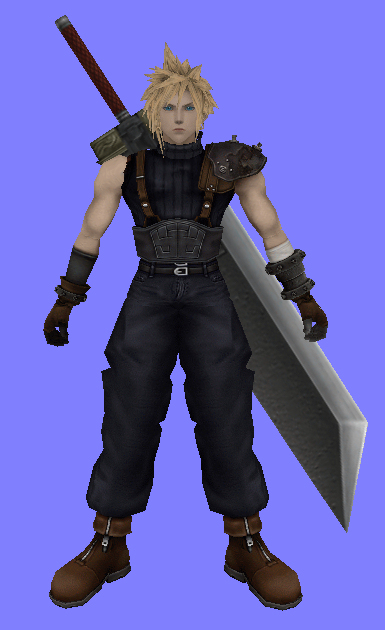 i don't want be mad but cloud head is reversed or is your intention leave the head how is in the images? if i'm right this happen because biturn.The program mirror the head when you convert some head to 3ds. so when you finish you need click 2 times in the p part and click in mirror horizontally. Oh you are right lol!!!! I had not noticed that hehe, thnx!!! I´m going to fix it right now. Edit: Hmm I have a question. May someone tell me what is the meaning of this alpha-numeric (The one in red) code in the rsd files? cos for any reason it is missing in all my rsd files. Sorry for the maybe silly question but I´m still learning!! YAAAAAAAAAAAAAAAAAAAAAAAAAAAAAAAYYYYYYYYYYYYYYYYYYYYYY I finally got the model showing its textures in game!!!!! The problem was that alpha-numeric code in the rsd files, idk why , it was missing in all my rsd files so Copied the code from the original cloud files and it is working now!!!! Thnx a lot for the help anyways guys, I guess this thread will help some other newbies like me! Here is the model (with his head mirrowed btw xD) although the head looks a bit weird in game and also this head keeps very rapidly appearing and disappearing intermittently, but still I´m very happy with my progress today hehe. And this is how it looks in kimera... Wha is the cause of this little differences between both models? Do i need to use the "Flat" buttom on every part in kimera to get a better look in game? Yea Philman there are no holes in the mesh (which looks really ugly when any animation is running), but I would like to know how to fix some details, for example, Idk why the texture is messed up on the feet, it seems like the uv map coordinates are right, but the thing I like less is the slight deformation that happens to the model in game. Idk if it´s just me or, when you see the model in game, the head looks smaller, and the general appearance looks a little disproportionated; also the head disappears and appears very quickly and intermittently every 2 or 3 seconds (not that it is very annoying, but it is strange). You need to give the head two models. One with his eyes open and one with them closed, so when he blinks it will display correctly. As for the size changes, try different versions of Kimera. 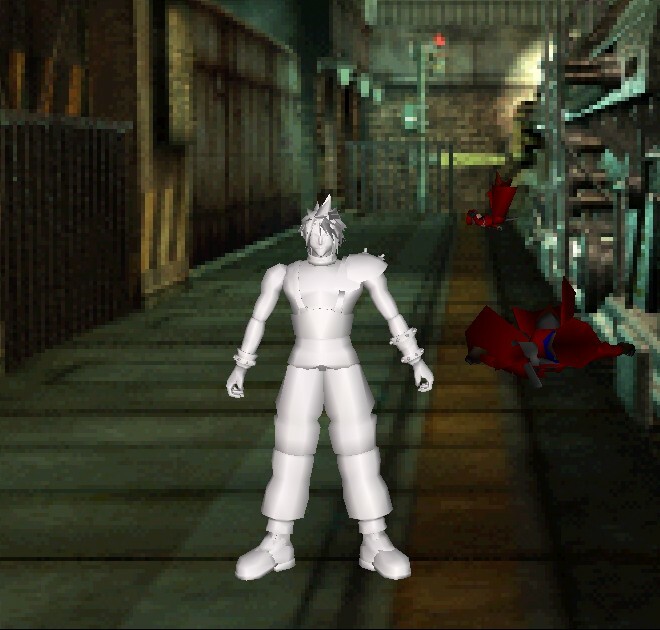 As for the shoes, when you imported them into your 3D program the mesh got messed up. 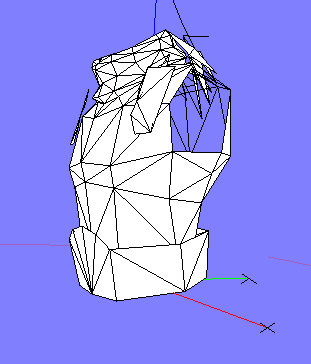 Oh I see obesebear so that´s why it disappears and appears, but how can I give two models to the head, I guess I will need two different uvs isn´t it? or actualy 2 different models? Thnx!! No not at all. Click on the head, then click add part to bone and add a second head. Now, if you want it to look like he's blinking, you'll have to edit the texture and have the new head use the new eyes closed texture. Honestly it's just easier to slap the second head on there and call it a day. No one really cares about the eyes blinking, it looks bad anyways. Yea Obesebear i was about to post cos I figured out how to do it hehe, I did exactly what u just said and I also got the feet fixed, and the head looks more proportionated in game. Btw, I did a second texture for the second head which has the eyes closed, but for any reason and even when the head is not disappearing anymore, the Cloud eyes are not blinking, but well just like u said, no one cares about the eyes blinking, so no problem. Thnx a lot for all the help, I´ll keep learning stuff, the next character will be Sephiroth or Aerith. hey guys i searched around but couldn't find it. where can we download his cloud field mod? I'm fairly certain this is a custom model made by the original poster of this thread. I know the body is from APZ's cloud (which can no longer be found on this forum because the face texture was ripped from another game, but it is out there if you want to use it. google) converted into a field model (which will take some precious time) and the head looks like it might be coming from a kingdom hearts model, which cannot be legally distributed and therefore cannot be found on this forum. However if you know what your doing feel free to rip the models yourself. 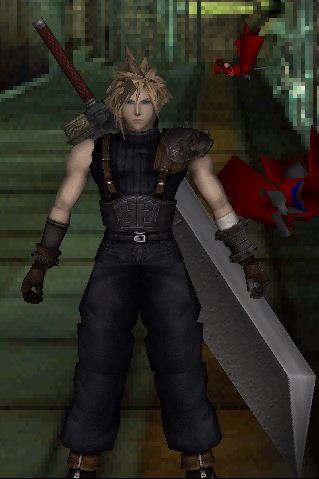 I have actually made a custom model myself for cloud and posted just recently, perhaps you'd be interested, its nothing like this however, its more in toe with the original game graphics with more detail. Check it out if you like, there's also some links to other really nice field models in my thread.